A £160,000 project aims to boost the water vole population in east Devon. The project, funded by the landfill tax, hopes to encourage more of the mammals to migrate into the River Tale from rivers in Somerset and Dorset. Voles numbers have been declining across Britain and they were declared extinct in Devon in 2000, after a survey of waterways failed to find any. Nationally, it is estimated the population has declined from a million to about 200,000 over 10 years. The American Mink, which was imported into Britain, was partly blamed as it had become major predator. Some loss of the vole's natural habitat was also responsible. Voles were later reintroduced at the Tale after a project to restore a stretch of the river and improve its water quality. 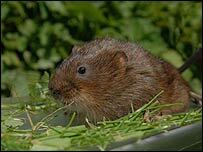 Mervyn Newman, who is in charge of the Water Vole Project, said landowners had been asked to help the animals thrive. He said: "One section of the Tale is good because a local farmer has been encouraged by the project to fence the cattle out of the river. This helps preventing diffuse pollution of silt getting into the water. "It also helps marsh and vegetation to grow up well, which gives good cover and food to the voles." If the animals do become more established in the Tale, it is hoped they will then start to spread out south and west, colonising a wider area.